Mrs. Mary Barbara Mueller, 93, 1414 South Park, died at 4:55 a.m. Wednesday at Windsor Hospital. Mrs. Mueller was born in Evanston, Ind., Feb. 22, 1872, daughter of the late Mr. and Mrs. Nicholas Purtzer. She was the last surviving of 12 children born to that union. Mrs. Mueller lived in Atchison, Kan., before moving to Sedalia in 1904. 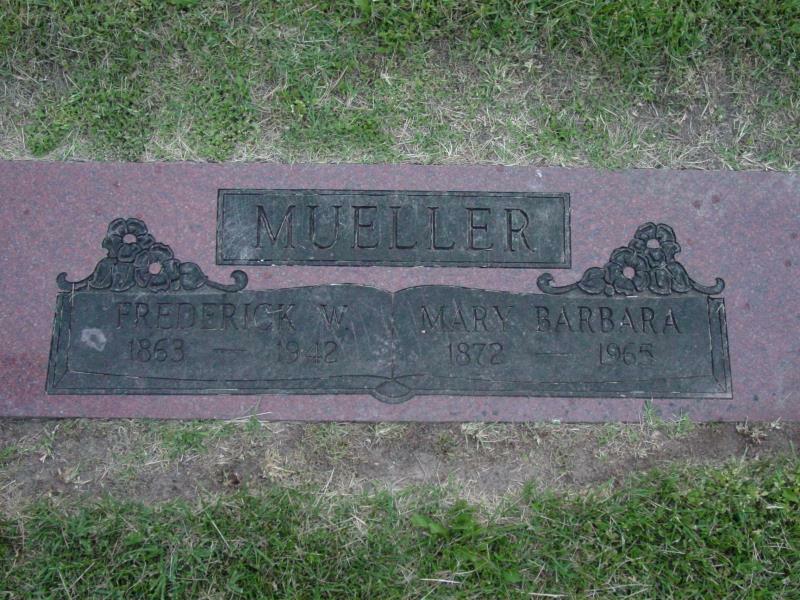 In Sedalia, she was married to Fred W. Mueller, who died in 1942. She was an active member of Ladies Aid Society of St. Paul’s Lutheran Church, where she held membership. Surviving are a daughter, Miss Freda Mueller of the home; three sons, Emil Mueller, of the home, H. G. Mueller, 1201 East 19th, and William J. Mueller, Denver, Colo.; nine grandchildren and one great grandchild. Funeral services will be at 1:30 p.m. Friday at Gillespie Funeral Home. The Rev. Walter F. Strickert, pastor of St. Paul’s Lutheran Church, will officiate. Burial will be in Memorial Park Cemetery. She had only 5 grandchildren. Mary Mueller was my g-grandmother. Funeral services for Mrs. Fred Mueller, 1414 South Park, who died Wednesday, were held at 1:30 p.m. Friday at Gillespie Funeral Home, with the Rev. Walter F. Strickert officiating. Burial was in Memorial Park Cemetery. Honorary pallbearers were E. C. Schlichting, James Bohon, Carl Bergmann, Phillip J. Bergmann, Ralph Hamlin, and W. R. Ramthun. Active pallbearers were Al Schreiner, Leonard Koehring, Harold J. Bergmann, Kenneth Clifford, Paul Alpert and C. I. Lewis.